This beautiful greystone on Versailles was once abandoned. The wall had even crumbled, as seen in the 2011 photo on the left. Fortunately, it wasn't demolished. It was beautifully renovated to its former glory! Ce bel immeuble en pierre grise sur Versailles a été une fois abandonné. Le mur avait même écroulé, comme on le voit sur la photo à gauche prise en 2011. Heureusement, il n'a pas été démoli. 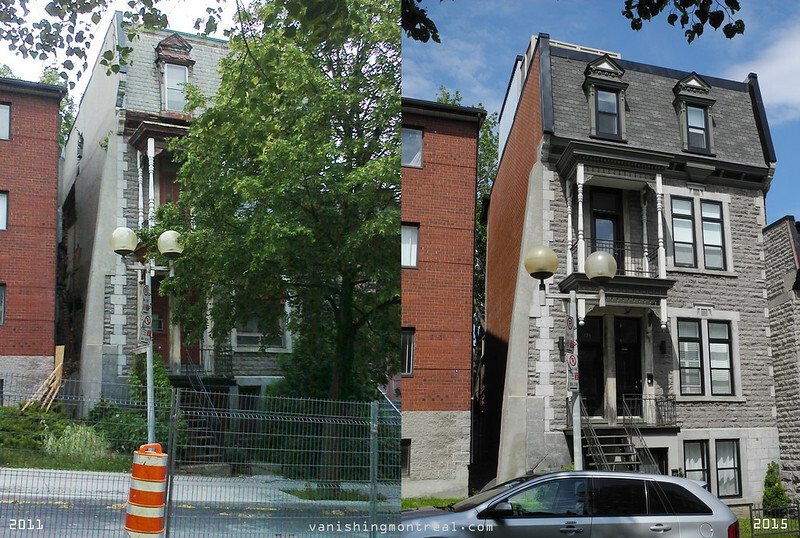 Il a été magnifiquement rénové dans sa splendeur d'antan! Hurrah! And thank goodness the owners tore that '60's/70's-era picture window out and replicated the original look of the windows. Too bad the big city-owned tree disappeared, though. Can't have everything, I guess.